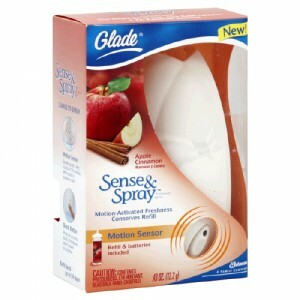 UPDATE 12/26: Congrats to Kendall and Melissa for winning a Glade® Sense & Spray® Automatic Freshener of their very own. Stay tuned for more giveaways to come in the New Year! When I think about the holidays, the first thing that springs to mind are the sights of the season: Christmas lights, decorated wreaths hanging from doorways, tinsel glittering and Santas everywhere. But equally as important are the smells associated with the holidays, like pine, cinnamon or baking cookies. What you smell when you walk into a room can be every bit as important as what you see. This is why I love the new Glade® Sense & Spray® Automatic Freshener. These things are so sophisticated now, that you don't have to do anything! The innovative Glade® Sense & Spray® Automatic Freshener detects when someone passes by, instantly releasing a burst of fragrance into the air. · Keep your decorations pared down to just two or three colors per room and use winter designs such as stars or snowflakes. This way your favorite decorations can be left up, creating a winter theme in your home. · Use air fresheners that allow you to change the scent for the season like Apple Cinnamon are festive during the holidays but usable year round. Plus, you can switch to scents like Lavender & Vanilla or Hawaiian Breeze in the spring, all with one easy refill change. The lovely folks at Glade® have given me TWO Sense & Spray® Automatic Fresheners to give away! All you have to do is comment below or on my Facebook Page and tell me what your favorite holiday scent is. That's it! You have until midnight on Christmas Day to enter. I will select two comments at random from all of the entries a week from today, December 26, 2010. Find your signature scent at GladeScentandStyle.com. *This contest will end in one week (midnight CST Saturday, December25 , 2010) and I will select a winner through random number generation and notify the winner via email. The winner will also be posted as an UPDATE on this blog post. The prize is being provided to me free of charge by the wonderful folks at Edelman on behalf of Glade.